NLP is described by many as "The study of the structure of subjective experience". Modelling other successful people is often regarded as the key method for finding out what this structure is and as a psychologist Bruce ensures that the models he trains his delegates in are supported by empirical evidence. Look at this great piece of research by Social Psychologist Amy Cuddy, which shows how behaviourally modelling successful body language improves the chances of actually becoming successful yourself. Bruce Grimley along with Co-Trainer Dave Woolley provide NLP training which is down to earth and practical, however is also based upon best practice in psychology too. What we find is that using this successful formula not only do delegates obtain the changes they want in their life, but that these changes are both sustainable and generative too. Take a look at some of the testimonials on this web site. Bruce consistently contributes to the NLP literature and you can read a research article written by him when you click here on page 4 in Rapport, and more recently another article here. His own NLP book and chapters on NLP in other books can be seen below and purchased by clicking on the links. Bruce's AMAZON AUTHOR PAGE. is at this link. Bruce's burning platform is his perceived need that NLP begins to evidence their claims more in the research literature and he reaches out to the NLP community making his case in the excellent NLP journal Acuity. Bruce is currently more involved with academic work and one to one coaching and so unfortunately only in a position to offer NLP training and Coaching training to ready formed groups of 6 or more people. Our brochure is designed to just give you a sense of who we are and why we think NLP has such a useful practical set of tools and why we think those tools are worth mastering. The positive side of this offering is if your group has a specific purpose for which NLP can usefully create a well formed outcome and provide you with the tools to actualize that outcome we can texture your course around that purpose. In this excellent accredited course not only will you become accredited as an NLP practitioner but also obtain added certification from the International Association of Coaching Institutes (Fundamental Coaching Skills) , (ICI) or the International Association of NLP Institutes (NLP Communication), (IN). Bruce will also provide you with a free supervisory session if you wish to become accredited as a coach with either the International Association of Coaching Institutes, (ICI) or theAssociation for Coaching (AC), both world leaders in the Coaching Profession. I invite you to browse the Internet and see if any other NLP or Coaching training provider offers you so much quality for such an affordable price. Our training in Cambridgeshire is easily accessible being close to both the A1 and M11 out of London with also many rail links to the rest of the country. Because of the high quality of this training it may be recognized as ECTS (European Credit Transfer and Accumulation System) credit points in academic studies in psychology with a focus on NLP and Coaching. NLP is a way of life for those who wish to get the best out of themselves. One Caveat is there is a lot of Hype and non professionals training people in NLP. Bruce is a Master NLP trainer as well as a Chartered Psychologist and with Achieving Lives NLP training you are assured of great quality training which meets the rigorous standards of the International Association of NLP Institutes and the Association of NLP. Books in which Bruce writes Chapters on NLP. 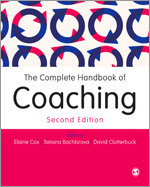 His own book on NLP coaching was published by Sage in 2013. Click on the links. More and more we are seeing online, short, cheap, quick and inferior courses calling themselves NLP Practitioner Certification. They are not. 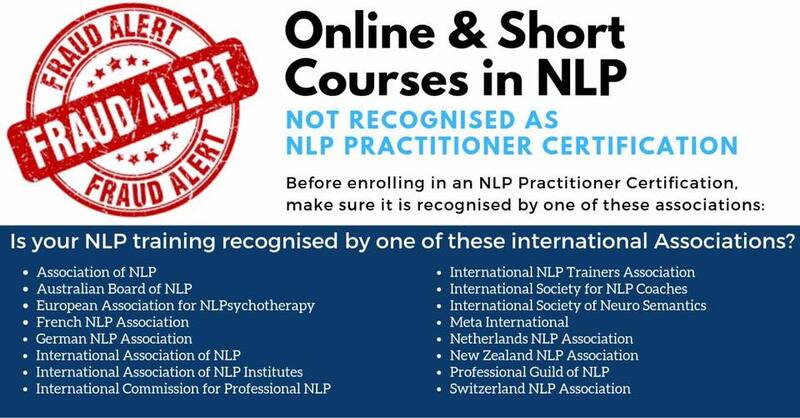 As an initiative of the NLP Leadership Summit, we wish to share the following message: “Before you register or complete an online or short course claiming to be an NLP Practitioner Certification, please check to make sure the course is recognized by an International NLP Association.